I really think spinning has become a serious addiction. It’s so easy to get carried away… just one more piece… oh no, there’s a pink bit, can’t stop now… you get the picture! After my first attempt I learned so much from other bloggers and this time I decided to experiment with completing the whole process, from initial spinning and drafting to plying and skeining, followed by setting the twists. Because it was an experiment I decided not to spin too much in case it went wrong at one of the stages and I ruined hours of work. The spinning and drafting seemed much more comfortable and I got into a good rhythm. 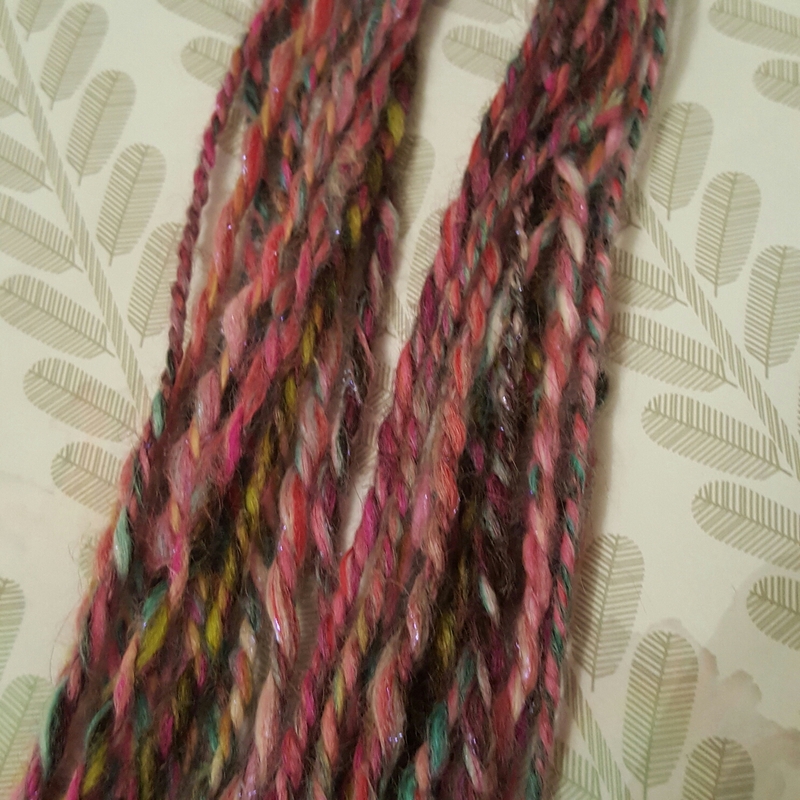 I also managed to make a slightly finer yarn by making narrower strips of roving before I even drafted it. The over twisting that I had suffered from on my first attempt wasn’t so bad as I counted in my head each time I span it and got more even results by doing so. Following the advice of Madgeface (Little Golden Notebook) I let it rest on the spindle overnight. I then plied it using my heavier spindle and kept a more even tension so it seemed to twist together really well. I then left the plied yarn to rest overnight (mainly because I was waiting for MrCraft to buy some plastic pipes to make the niddy noddy with!) Tonight after work I cut up the plastic and made myself a niddy noddy, which I used to wind my yarn into a skein. The twists are not completely even, but the thickness is more consistent than my first attempt! This yarn looks so much better than my first attempt (in my humble and inexperienced opinion! 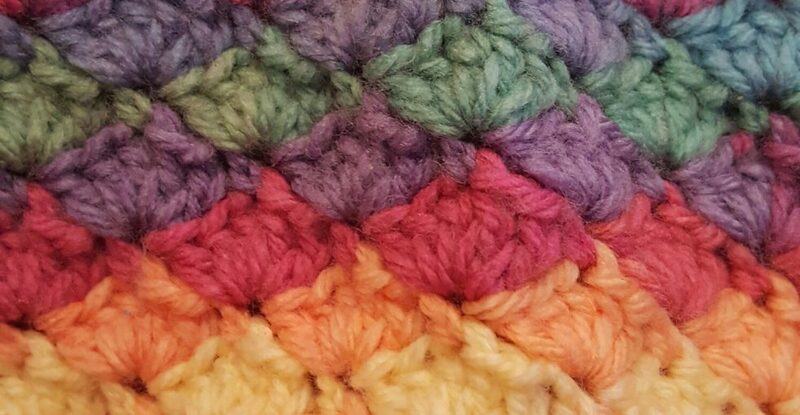 ), and now I have tried the process from start to finish I’m going to ‘go for it’ and turn the rest of the roving into yarn that I will be able to use. I can’t wait, but I have a few projects on so I may have to remain patient. Approximately 7 yards of finished handspun yarn! It looks great! Don’t be afraid of felting your yarn while finishing it; you need to soak it really really hot water & then take it outside on a cold winter day to whack it on a cold bench to felt it. I may be speaking from experience. 😬 Whacking it – literally whipping the skein against a hard object, like the side of the tub or side of a sink, will also help even out the twist. And it’s fun if you’re having a bad day. 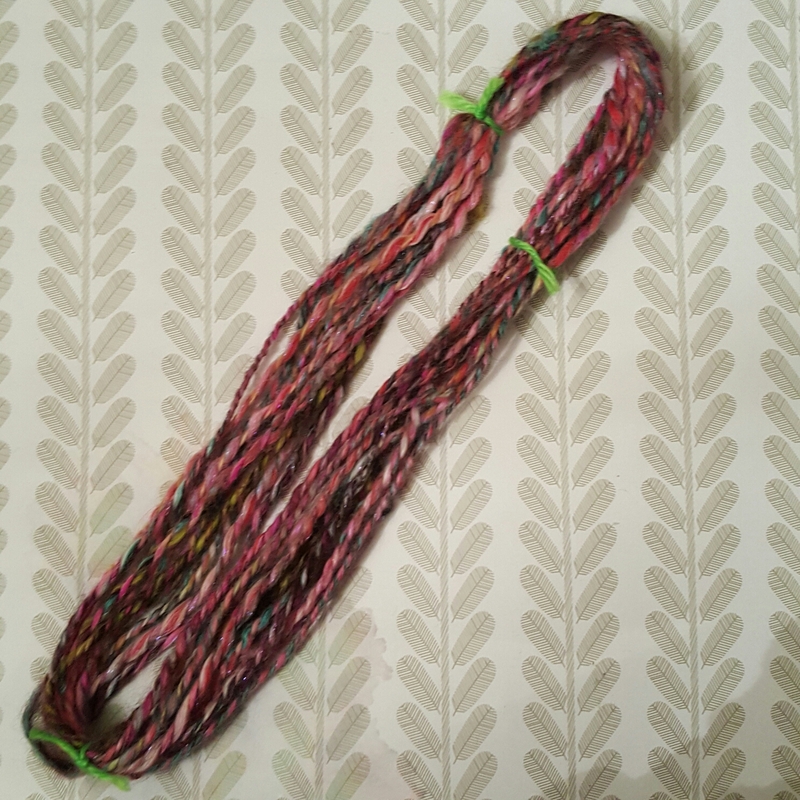 Anyhoo – your mini skein looks great! Keep going! Would you look at that, what an improvement. Well done you. I can see your progress! what a delightful hobby! Best wishes on this! Wow! I am completely intrigued. It looks super. Well done! CONGRATULATIONS and very well done! I can actually see your progress! Aww this absolutely fan-dabi-dozie. I’m so thrilled for you that I actually have funbumps! I can feel your excitement from your post and it’s so lovely because this is something that you’re teaching yourself. You’re doing it all by yourself … and because of that the achievement is even greater. Looks really, really good for early spinning. I’m addicted to spinning, love the feeling of making my own yarn, very relaxing and knitting with yarn you spun yourself is magic! Well done it looks great, it is scary when you put so much time into something I agree! Thank you, I haven’t picked it up for ages, I’ve been to busy making things with the yarn I already have.